Pastor Erdos grew up in Butler, Pennsylvania, a town forty minutes northwest of Pittsburgh. After attending Grove City College, Grove City, Pennsylvania and graduating with degrees in Economics and Finance and a minor in Philosophy, he attended Trinity Lutheran Seminary in Columbus, Ohio. 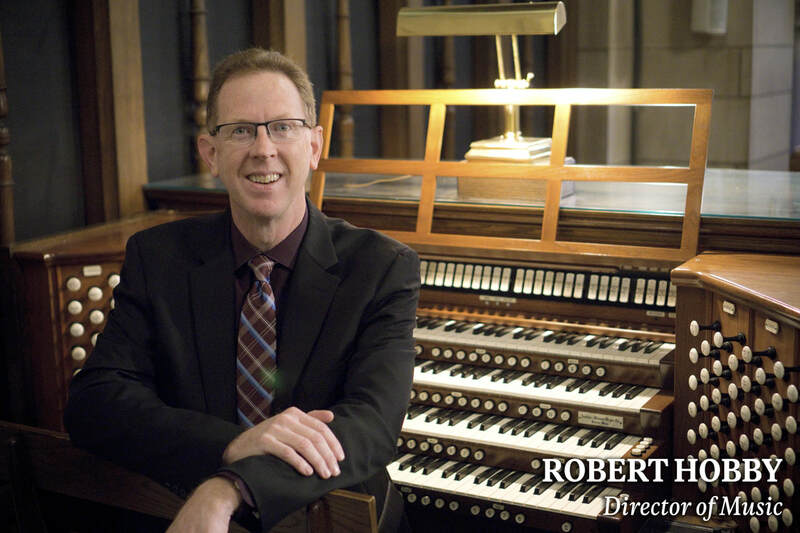 In his time at Trinity he spent a year at the Boston Theological Consortium and a year on internship at Faith Lutheran Church in Arlington, Virginia. While in seminary, he had the opportunity to work with Walter Bouman on the Concordat of Agreement with the Episcopal Church, one of the documents leading to the full-communion agreement between the ELCA and Episcopal Church. After graduation, Pastor Erdos served parishes in South Park, Mt Lebanon and Freeport Pennsylvania – all near Pittsburgh and then St Mark Lutheran Church in Yorktown, Virginia. In this time, he participated and taught courses at the College of Preachers of Washington Cathedral and became involved in Ignatian spirituality, leading and participating in retreats related to Jesuit ideas. 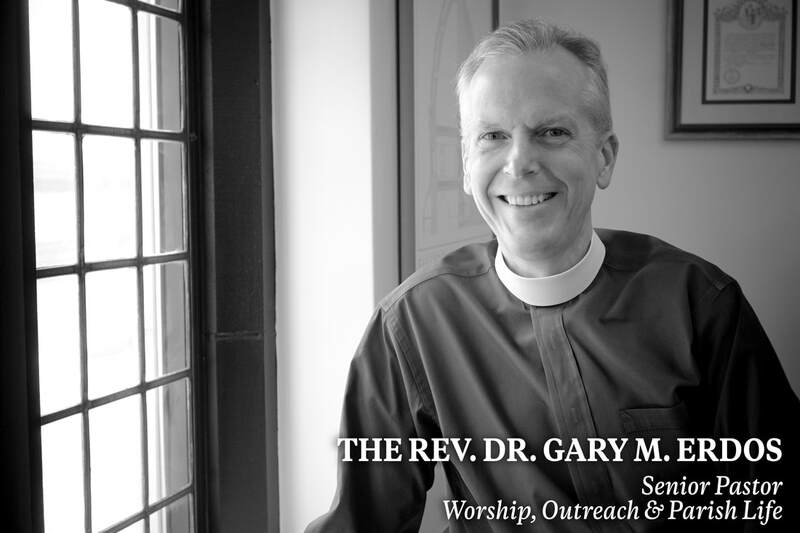 While at St Mark, Pastor Erdos and the parish of St Mark were involved in Diana Butler Bass’s project studying the revitalization of mainline congregations. The ministry of St Mark was one of the parishes highlighted in Bass’s book, Christianity for the Rest of Us. Pastor Erdos is married to Luanne Erdos, a marketing and business teacher at Concordia Lutheran High School where she also heads the Honors Academy. Luanne has also taught in New Hampshire, Ohio, Pittsburgh and Virginia where she has headed a number of popular marketing programs for high school students. Their older son Andrew lives in Northern Virginia and younger son Peter is a student at St. Mary's College in Maryland. Pastor Haller is a native of Detroit, Michigan, but has called a number of other states home: Pennsylvania, Alabama, Kentucky, South Carolina, Texas, Ohio, and, for the last three-plus decades, Indiana. By sheer longevity measure, it would seem that she is an adopted Hoosier. Her undergraduate degree was awarded in history and political science. She graduated from Lutheran Theological Southern Seminary with a Master of Divinity degree and, later, from Luther Seminary, with a Doctor of Ministry in Congregational Leadership and Mission. She came to Trinity English as an associate pastor in December 1984 . . . and never left. She finds joy and inspiration in her work at Trinity English and with the good people she encounters within and beyond the congregation. 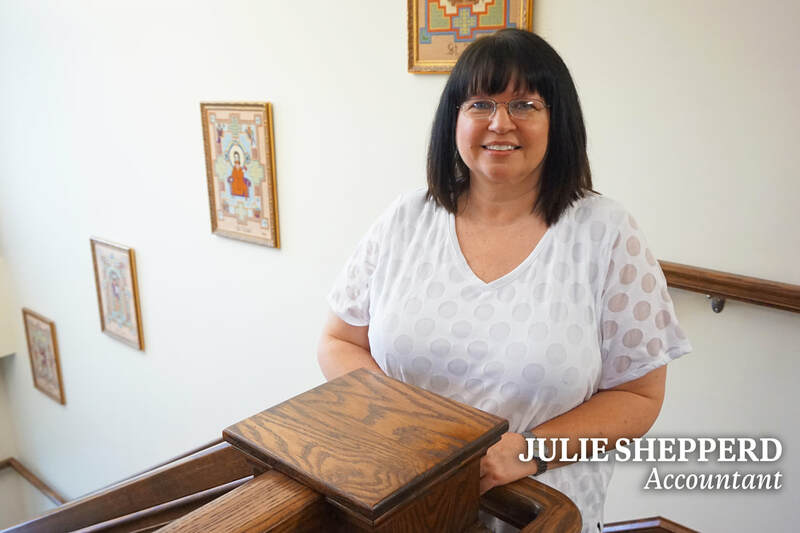 Plans are for her to retire from the full time pastoral ministry of Trinity English in June 2020.
lives and works in Fort Wayne, was awarded a BA in history in May 2018 and, relatedly, cares deeply about the condition of the world and its inhabitants. Son, Jonathan, a student and resident assistant at University of Indianapolis, is working toward completion of his undergraduate degree and planning further studies in health care. Stan Whippo, Pastor Haller’s father, retired at age 92 from 5-days-a-week volunteer work at a classical music Station and now actively explores new opportunities at Lutheran Life Villages in Fort Wayne. Pastor Anderson grew up in Fort Wayne and lived for a time in such places as Honolulu, Kansas City, and Indianapolis. He returned thirty years ago to make Fort Wayne his home. Prior to joining the Trinity staff, Pastor Anderson served as Executive Director of Just Neighbors Interfaith Homeless Network, Senior Pastor of First Presbyterian Church, Executive Director of the Samaritan Counseling Center, and Associate Director of the Associated Churches of Fort Wayne and Allen County. He has worked as a campus minister, hospital chaplain, psychotherapist, social worker, health care administrator, and adjunct college professor. Pastor Anderson holds graduate degrees in theology, psychology, and social work. He is an ordained minister of the Presbyterian Church (USA) and the United Church of Christ. ​Nominated by the City of Fort Wayne, Pastor Anderson received the “Gandhi King Ikeda Community Award” in 2008 from the Martin Luther King Jr. International Center at Morehouse College for “lifelong commitment to social justice, community-building, interfaith and interracial dialogue…distinguished leadership of American society for human rights, humanitarianism and peace … extraordinary compassion for those in need and efforts to promote unity through diversity...a life of stirring witness to the Prince of Peace and the God who is love.” Previous recipients of this award include Rosa Parks, former United Nations Ambassador Andrew Young, several members of congress, community leaders, and international advocates for peace and justice. Pastor Anderson was the longtime chair of the Peace and Justice Commission of Allen County and a founding member of the Mayor’s Commission for Interfaith Understanding. He is a former adviser to Mayor Tom Henry on issues of social justice and community engagement. He is married to Janet Anderson, a nurse practitioner for Park Center. They are the parents of two adult sons and grandparents of three. Maggie Milne brings a youthful spirit to her role as Director of Family Ministries. Christ “left the ninety-nine” to grab hold of Maggie October, 2000 and she has continued to deepen her faith journey ever since. Maggie brings extensive service to youth and families through her training and volunteer work while studying at Butler University earning a Master’s Degree in Education, specializing in School Counseling, as well as professional success with education, ministry, and nonprofit sectors. Most recently she has mentored her “little sis” through years of service with Big Brothers Big Sisters, excelled while fulfilling her role as Family Support Worker through the Healthy Families Program and Work Experience Coordinator through Be SomeOne Now Program while employed with SCAN Inc. Maggie looks forward to establishing and fulfilling the vision TELC youth and families have for the Department of Family Ministries. Her door is open and she welcomes your visit and/or communication any time! Rebecca has the fortunate role of helping Trinity find its place in the downtown neighborhood. As managing editor of Trinity's magazine, Thinking Out Loud, she gets to raise timely issues to a larger focus and find ways to include Trinity in the broader conversation. Rebecca is always looking for ways to connect Trinity members to one another and to the opportunities present in our larger community. 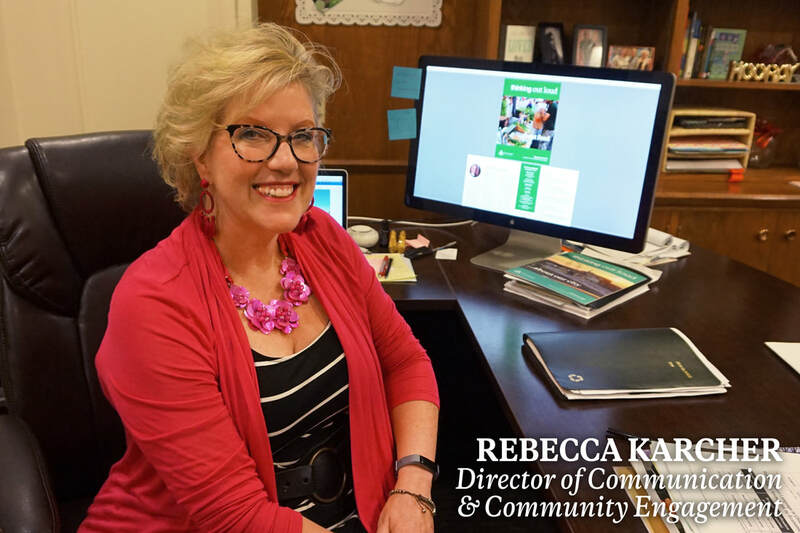 Rebecca’s career has included two different stints with Fort Wayne City government, as well as public relations work with advertising agencies. She is a Kansas City native who came to our city to work as the executive producer of news at WPTA-TV and ended up making Fort Wayne her home. She and her husband Rich (a local attorney), are very proud of their Wittenberg graduate student, Justin Fisher. Both Justin and his father, Dave Fisher, are also members of Trinity English. In her spare time, Rebecca enjoys acting in community theater, practicing yoga, and being involved with different groups to support women's involvement in public service. 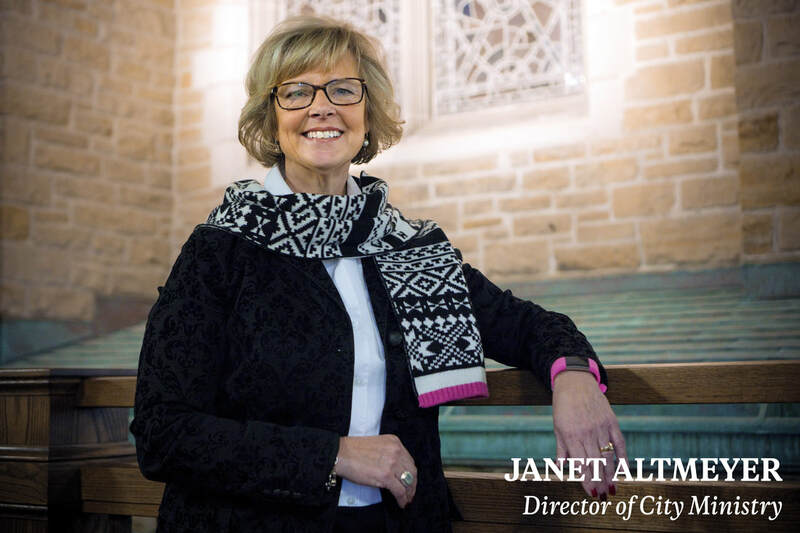 As the Director of City Ministry Janet works closely with the pastors and staff of Trinity English Lutheran Church, volunteers, and community partners to engage people in meaningful and supportive relationships. Janet oversees Trinity English’s Mental Health Ministry, which is based on Craig Rennebohm’s Companionship model, designed to reduce isolating behavior and build a vibrant community of faith. Janet is an honors graduate of Vanderbilt University and The University of Saint Francis. For over 25 years she consulted and taught students with psychological and other learning challenges. In 2009 Janet joined the staff at Trinity English Lutheran Church. She is an amateur landscape designer, animal lover, reader, and story enthusiast. Along with being a grateful wife, mother, daughter and sister, she is the Founder/ Executive Director of PAWS, Inc. (Pets Assisting Well-Being and Success, Inc.,) an animal-assisted therapy and research organization. 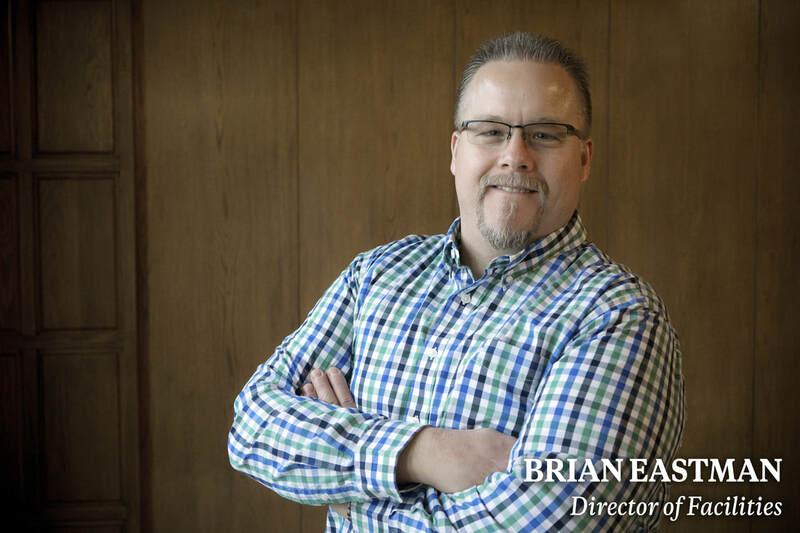 Brian Eastman is a lifetime resident of the Fort Wayne area and joined the Trinity English Ministry Staff in March of 2015 as Director of Facilities. Brian came to Trinity English from the City of Fort Wayne's Division of Community Development where he worked as a Community Development Project Administrator, Program Manager and Construction Specialist. Brian is a licensed Building Contractor, licensed Insurance Adjuster and a former construction company owner with property maintenance and management experience. Brian and his wife, Melissa, keep busy with their five children and enjoy outdoor activities. Brian is excited with the opportunity to help maintain the historic facilities and be part of the ministry of Trinity English. 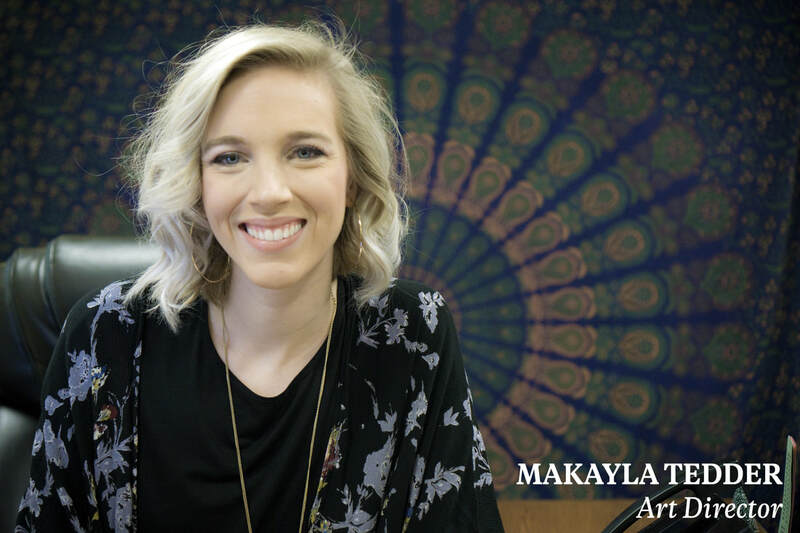 Makayla, a Fort Wayne native, is bringing her skills in layout and design as well as an artistic sensibility and perspective, to the Communications team. Makayla utilizes a range of communication tools, such as graphic design, managing the website, illustrating sermons, putting together the Sunday bulletins and more, so people can stay informed about opportunities and news from Trinity English. Julie Shepperd joined the Trinity English Staff in June, 2018 as the Accounting Manager. Julie is a graduate of Indiana University, with a Bachelor of Science degree in Business Management. 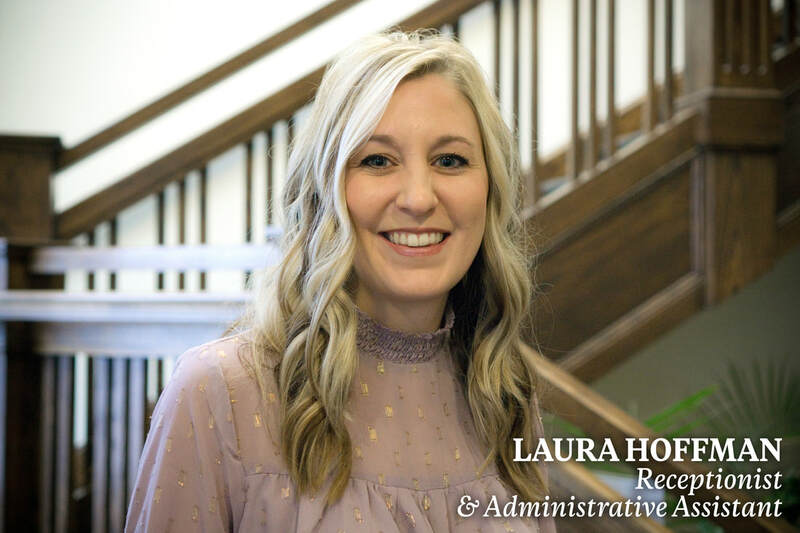 She previously worked for Lincoln Financial, Fort Wayne Children’s Zoo, and Katz Sapper & Miller, as an accountant. She is originally from Decatur, then moved to Florida for a few years, and is now a resident of Fort Wayne. Julie has 3 adult children and 5 grandchildren and loves to spend time them, whenever she can. The first to fill this position, Sara is working to make connections with our neighbors downtown. She says her main tool will be listening-- to find out more about their lives, their experiences and their concerns. As a hometown girl, Sara loves all things Fort Wayne and thinks her position at Trinity is a great fit for her. She brings experience in community relations as a former news anchor and reporter for our local CBS affiliate, WANE-TV. A graduate of both Bishop Dwenger High School and Ball State University, she double majored in journalism and telecommunications. She is very happy for the opportunity to continue her writing through blog posts and working on Thinking Out Loud. Sara is also a big animal lover. You may also see her floating around at anything involving the outdoors or music. She is excited to meet all of you and appreciates receiving such a warm welcome. Sara invites you to join her in in this new journey of figuring this position out! Laura is the friendly greeter that you will see when you come into Trinity English. She is also a licensed hairstylist. On some of her spare time she enjoys decorating her home, and crafting. One of her favorite things to do is spending time with her husband designing woodworking projects, and chalk painting old furniture. She also really enjoys traveling, and visiting new places. Julia grew up in Colorado and joined TELC when she moved to Fort Wayne in 1991. She is married to Dan and is a mother of three - Ryan works in IT In Columbus, OH; Rachel is an Art Therapist in Chicago, and Regan is a middle schooler who plays soccer, dives, and cheers. Julia loves to travel, read, and hike in the mountains. She is really excited to be a small part of the great ministries at Trinity.